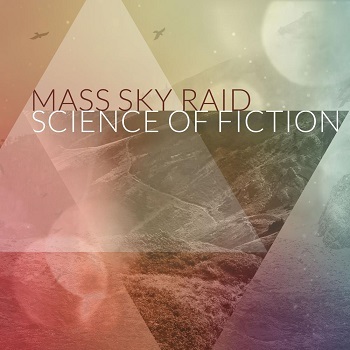 Mass Sky Raid is a brilliant unsigned band from the Gold Coast of Australia, they released their debut EP "Courage Under Fire" in 2013 that was co-produced by Forrester Savell (Dead Letter Circus, Karnivool). The new album "Science of Fiction" is produced by Matt Bartlem who started as an assistant at the Loose Stones Studios on the Gold Coast under the guidance of ARIA award winning producer Forrester Savell. Matt has done a great job with "Science of Fiction" and I bet we´re gonna hear more about him in the future, this record clearly has the Savell-touch to it but with Bartlem´s own signature which has a more rougher approach to his view of a rock album in 2018. Mass Sky Raid is Adam Lomas - Vocals, Alex Kewley - Guitar, Cameron Dobinson - Bass and Morgan Blake - Drums. A tight unit that is ready to take the world by storm. The album opens with "Mirrors", a brand new track with Big Country-ish guitars and a lovely atmosphere of modern progrock the Aussie way. The chorus is not a direct smash but slowly is working it´s way into my brain like a drill. "Sacrifice" comes next and it was released as a single in 2017, I´m glad they included it on the new album because the song has everything Mass Sky Raid stands for. Upbeat and fresh modern rock with a superb chorus, so memorable and a perfect fit for the setlist when they perform live. "Enemy" is track no.3 on the album and this one was delivered as a single in 2015, a truly solid album track with a wall of guitars. Nothing could be more appropriate. "Edge of the unknown" is the lead track of the album and the new single, it´s also my favorite track on "Science of Fiction", from the suggestive verse to the powerful chorus that is pure perfection. The 5th track is "Chemical design", another great single from last year, well worth it´s spot on the new album, making "Science of Fiction" look more and more like a Best of compilation. "This moment" is another brand new song that starts like a knockout but then opens up with a beautiful soundscape in the verse that leads to the majestic chorus, yeah a real winner. "Closer" is one of three singles released in 2017 and a typical Mass Sky Raid song, perhaps the weakest one on the album but still quite good. "Delirium" is the 4th new song here, just as rhythmic as "This moment" but a bit more straight ahead rocking, the guitar work from Kewley is faultless and I just love Blake´s drumming on both tracks. "Dream" is the last new song on the album that feels like it´s taking me on a journey, I can imagine myself being in a vehicle moving forward as a spectator in the film "Ready Player One". To wrap up the album in the finest of ways, the last track however is the 2014 single "Oceans", a really good alternative progrock song for fans of Skyharbor, TesseracT and Dead Letter Circus.